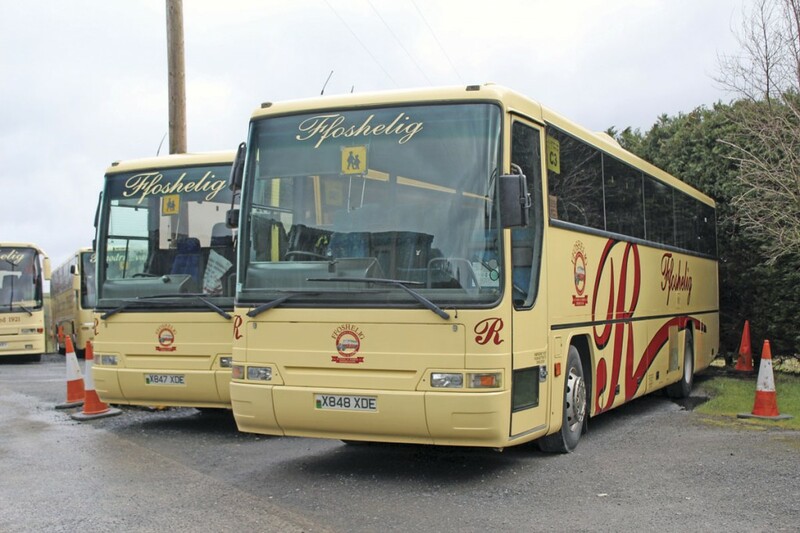 If you happen to be following one of the fleet of Ffoshelig Coaches you’ll notice the prominent promotional advertising they carry for www.thebestbarnsinwales.co.uk an additional string to the bow of a business that can trace its origins back 95 years to 1921. 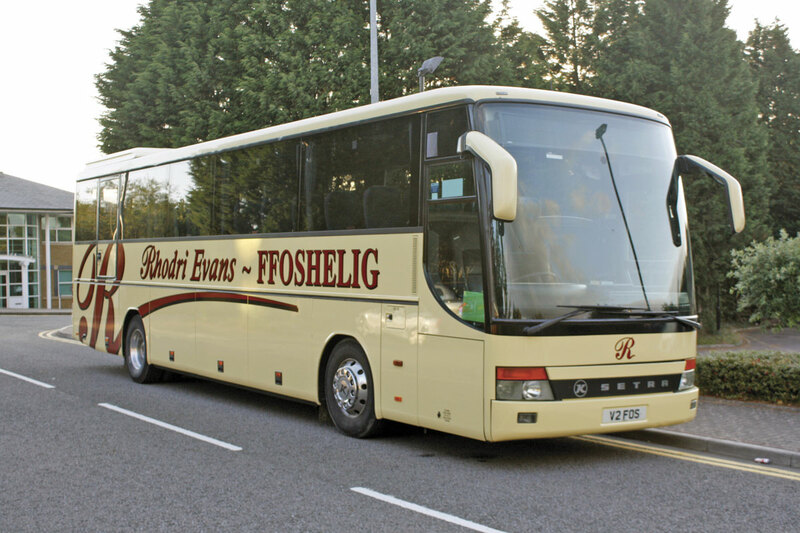 Rhodri and Debbie Evans have only been running Ffoshelig for the past 20 years since buying it from Des Jones in 1996, but he is the fourth generation of his family to live on the farm site at Maes Y Prior (Priory Meadow) near Carmarthen where the coach operation is now headquartered. 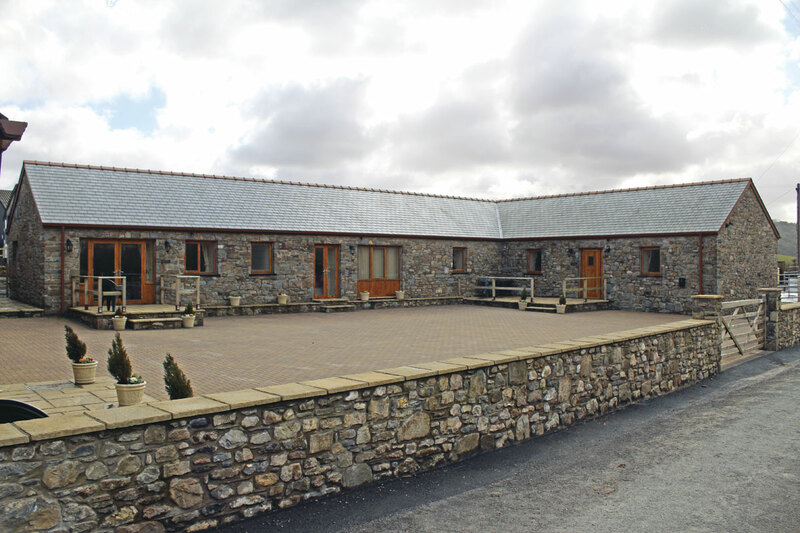 The 50 acre farm is a historic one once owned by the monastery in Carmarthen and mentioned in the Black Book of Carmarthen in the Library of Wales. Rhodri passed his test at his own expense in 1987 intending to drive part time as a hobby. He had just completed a national diploma in business studies and was living and working on his parents’ dairy farm. ‘I had always had a big fascination with coaches rather than buses and wanted to drive one. I also enjoyed meeting people.’ He drove for a number of operators including Davies of Pencader and Ffoshelig, also doing a little for Lewis of Whitland and a handful of jobs for Clive Edwards of Taf Valley when he first went from one to two coaches. ‘I ended up not only driving for him but also playing the piano at his concerts,’ said Rhodri, who remains a keen organist. He started running coaches on his own in 1995 with a 1980 Plaxton Supreme IV bodied Volvo B58 which, in the fashion of the time, had been modernised by the addition of the front grille panel from a Paramount 3200. It was replaced by a B-registered DAF SB2300 Paramount 3200 after five months. Debbie and Rhodri were together from the outset, though it was not until 2000 that they married. They had both travelled to school on Ffoshelig coaches, Debbie having moved to the area from Hove in 1987. 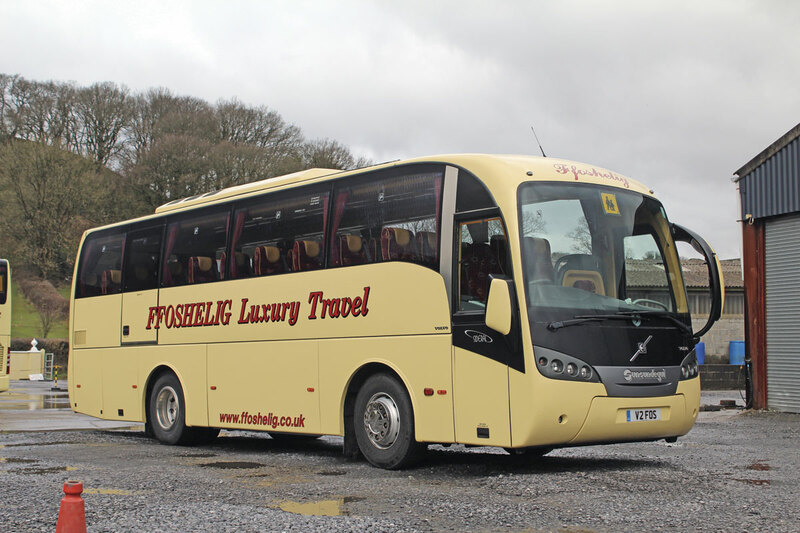 The coach initially ran from the farmyard but in 1996 a deal was done with Des Jones to acquire half of the Ffoshelig operation including three school contracts, the trading name and three vehicles; two Volvo B58 Plaxton Supreme IVs and a Bristol LH ECW bus. 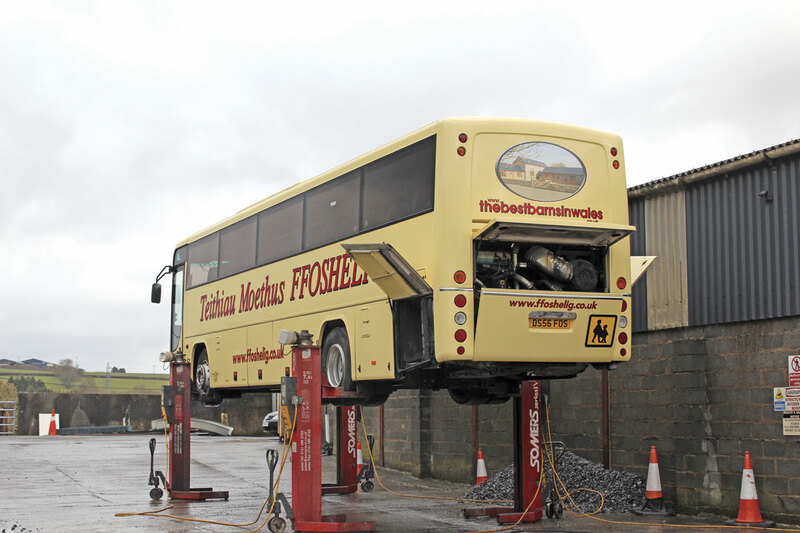 Ffoshelig’s other vehicles and contracts went to Lewis of Whitland and Castle Garage in Llandovery. 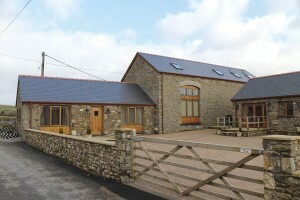 The takeover saw operations relocate to Newchurch, three miles to the north of Carmarthen but in 2003 everything moved back to the farm where it has been based ever since. By 1997 the fleet stood at seven coaches with five contracts held. 2006 saw another major expansion with the Carmarthenshire contracts of Lewis of Whitland acquired, though at that stage Lewis’s retained their Pembrokeshire operations. 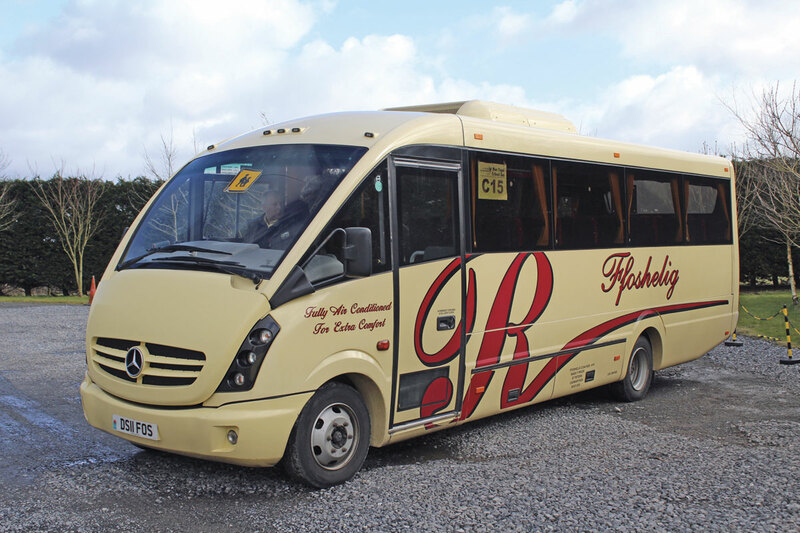 This brought Rhodri two school contracts and a commercial bus service between Carmarthen and Llanybri. 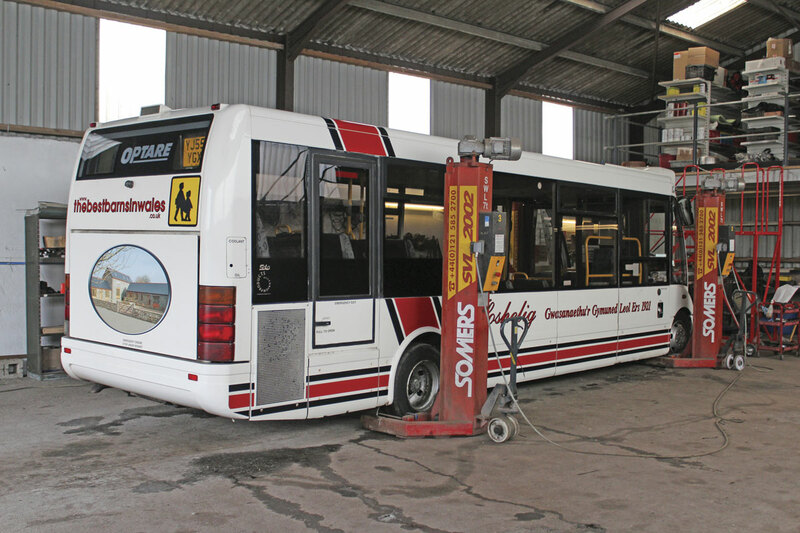 When First Bus announced it was downgrading the Carmarthen depot to an outstation and transferring maintenance to Swansea in 2009, Rhodri decided to compete with them on the 222 Carmarthen to Pendine service. However, as soon as he registered his intention to run it, First withdrew. To operate it, a new 11.1m Cummins powered Optare Versa was purchased with 38 belted high back seats and a wheelchair bay. Soon after this, further bus work was acquired when the Carmarthen County Council contract for a dial a ride service in and around the town was won, initially for a five year period from 1 January 2010 and since renewed until 2019. 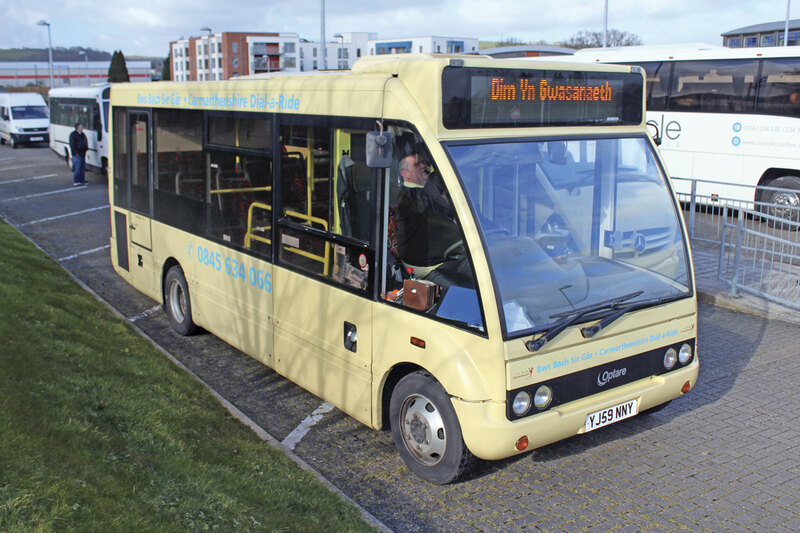 A new 7.1m Optare Solo 23 seater was purchased for and continues to operate it. The council operates the bookings system and sends an email every day with the instruction for the following day. Within it there are three routes (B11, B12 and B13) with timing points around the town. There are periods in the timetable during which the services can be diverted off route and at times might be asked to go anywhere within five miles of Carmarthen town. It operates six days a week and the same person drives five of them, as the contract stipulates that there should be no more than three people on the roster. Today there are seven contracts undertaken for Carmarthenshire County Council, the one commercial school bus route and the dial-a-ride service. A feature of Carmarthenshire contracts is that, since 2004, contracts can be bid for on one of three different standards. The Minimum contract runs for two years and at no point must vehicles used on it be more than 20 years old. The Standard contract runs for five years and the vehicle has to be less than 10 years old at the start. Finally there is the Enhanced Contract that runs for 15 years (originally 10 years) which requires that the vehicle is under a year old at the start. Payment increases are limited to the RPI so it can be that you can go a couple of years with no increase. 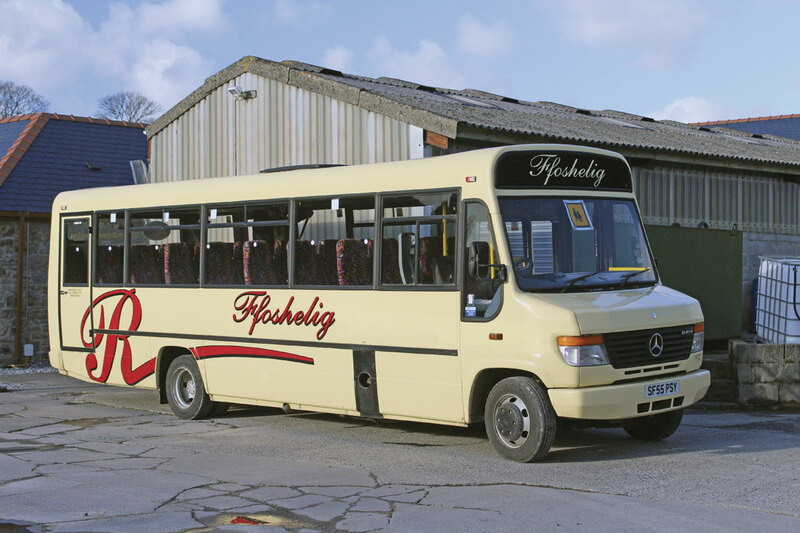 Rhodri commented, ‘The Council are pretty good to work for and we have a good working relationship,’ though, with contract lengths and stipulations completely different 15 miles away in Pembrokeshire he believes it would make more sense to have one transport policy for the whole of Wales. To date, he has not found that devolution has made much difference to the business. ‘We don’t have any behavioural issues with the children,’ he said. Though very well placed for the road network with the main A40 at the end of the lane on which the farm and yard are located, the spot is at the same time quiet, rural and rather idyllic. Across the lane from the yard, the farmhouse itself nestles on the slopes of a hillside with a wood rising beyond and often Red Kites flying overhead, sometimes in large numbers. Blessed with a considerable number of dilapidated stone outbuildings on the property, the couple first set about putting them to better use about a decade ago when a barn on the same side of the road as the house was converted to living accommodation. This is now on a long term let. 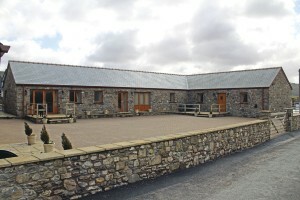 The largest of the properties is a two storey barn called ‘The Coach House’ converted to give four bedrooms, there are two two-bedroom units within the L shaped building that was the cowshed called ‘The Dairy’ and ‘The Parlour’ and the final one has a single double bedroom and is called ‘The Smithy’. ‘We tried to make all of them as spacious as possible,’ said Rhodri who pointed out that they all have underfloor heating and great views. Pets are welcome in all but ‘The Dairy’, which is being kept free of them because some clients are allergic to animal hairs. I stayed the night in the smallest of the four, ‘The Smithy’, and was very comfortable with everything I needed to hand. They are all fully equipped and have matching bed linen and towels. With handling the bookings, preparing the barns for their occupants, cleaning and maintaining them there is a lot to do and it is Debbie who looks after this side of the business. She spent 15 years as a manager in the NHS but left nine years ago when the office transferred to Swansea. She had held a PSV licence since they acquired Ffoshelig and still does the odd day on service as well as some double manning jobs and Heathrow transfers. Every family business has days when it is all hands on deck and there was an unprecedented Saturday in 2011 when one driver rang at 05.30 to say he was too ill to do a 12 hour shift starting at 06.00 after another failed to turn up at 03.00 which left Debbie having to substitute on the bus run taking the two children with her. Nevertheless, Debbie says she is not ‘heavily involved’ in the coach business and her responsibilities have to fit around the needs of the children, now 11 and 13. 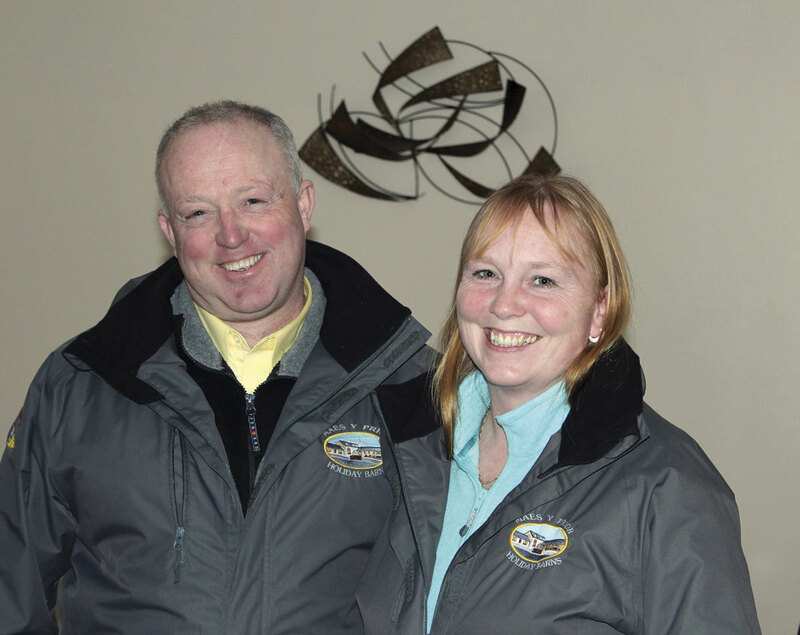 The couple are in the office every day and as well as managing the lettings, Debbie also looks after the accounts. ‘What’s nice is that it’s so different. We’re still dealing with the public but it is more structured,’ she said. Apart from their own website, a number of other sites promote the properties and the cost of these is their biggest single expense, though they do ensure that utilisation is good and getting better. They were full over Easter and bookings are looking good for the rest of the season. 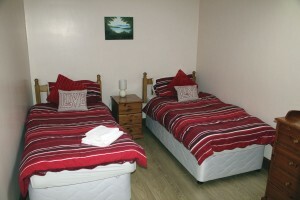 Seasonal and last minute offers are offered when it is quiet or there are places available. There are also the adverts on the back of the coaches. Debbie told me that they generated a lot of comments and people often took pictures of them in coach parks, and though there had not been any directly attributable bookings from them, you never knew and it could only help. There is a huge variety among the clients attracted and the periods they stay for. One Italian couple drove all the way from Italy, spent two days attending a rally locally, then drove back to Italy. 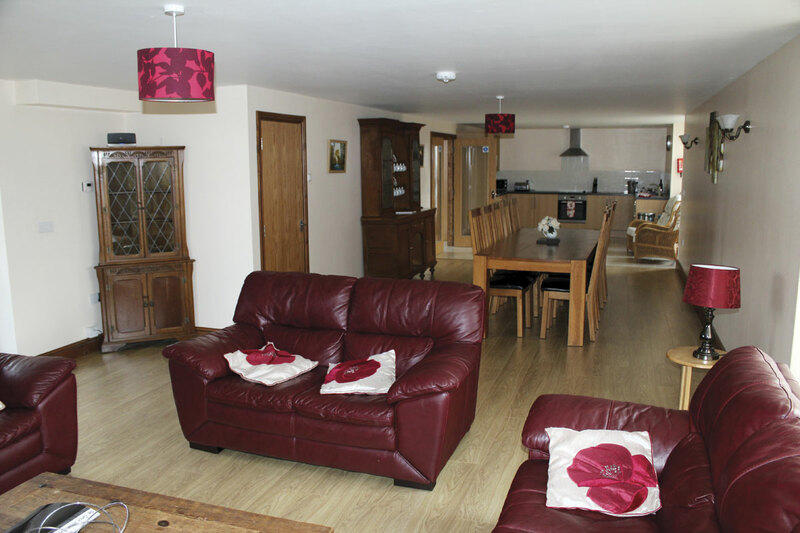 It isn’t just holidaymakers; one man spends a month there because he lives in a holiday park for the rest of the year and has to stay somewhere else for a month, and especially during the winter months, the facilities are attractive to contractors working in the area. Debbie has approached local businesses, hospitals and universities among others in order to promote the barns. A big difference between the two aspects of the business is that when any problems arise they are on your doorstep, which can be a disadvantage. ‘My worst fear is a boiler packing up. Each of the two buildings shares a boiler,’ said Rhodri. The proximity to the, entirely separate, coach yard is not a problem, some slight rearrangement of it having taken place that ensures most coaches are now parked further back away from the barns. The barns are by no means the first diversification from coach operation that Debbie and Rhodri have run. Between 2001 and 2005 a fleet of three Daimler DS420 limousines and a Coleman Milne stretched Ford Granada were operated on wedding work. The venture worked well but Rhodri decided to give it up in favour of an improved quality of family life and more time with his children, Amber and Ronnie. With running the coaches all week and weddings at weekends it had been leaving little time for anything else. Talking of the experience he said, ‘We learned early on always to ask if it was a Catholic wedding because they always take longer.’ One particular memory he recalled was of the wedding of a Welsh girl and an Italian man on a very hot day at a chapel some distance from anywhere. The ceremony was first conducted in her native Welsh tongue, and then repeated in full in Italian for the benefit of his relatives. Their friends, who were mainly from London, spoke neither Welsh nor Italian so the entire proceedings were then repeated again, this time in English! In wood and trees there is a tenuous link to the company name because the nearest translation of Ffoshelig Rhodri could give me was a sprig of holly. 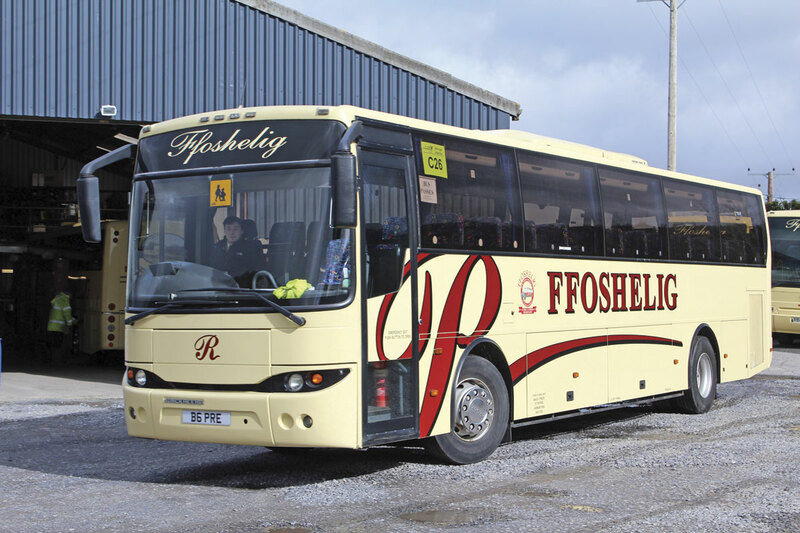 It should really be spelt ffoshelyg, ‘but that’s how it’s been since 1921.’ While all of the coaches carry the Ffoshelig name, some also carry Rhodri Evans with a very large R script down the side. This isn’t an ego trip on his part but an effort to get the message over that he owned the business. It started in 2007 when he’d owned it for over a decade and was still getting the occasional cheque made out to Des Jones. It seemed to work because the cheques all have the right name on now and in place of the R the Ffoshelig name is the more prominent along with ‘FFOSHELIG Luxury Travel’ on the offside and ‘Teitheau Moethus FFOSHELIG’ on the nearside. Rhodri is bilingual, Debbie isn’t as she sometimes has to tell people when they ring up, though she can understand more than some people realise. Incidentally, Des Jones is still alive and keeps in touch. In total, the current fleet stands at 13 with the recent sale of a 12.9m Berkhof Axial bodied VDL SB4000. The most it has ever been is 14 coaches which is the maximum Rhodri would ever want to run and, conveniently, the number the premises are licensed for. Under Des Jones, Ffoshelig had bought new coaches including grant specification Bedford Duples, a Ford Turbo Duple Dominant II Express and an X registered Ford Supreme VI Express, after which he switched to secondhand Volvo and Leyland heavyweights though the last brand new coach purchased was a DAF MB230 Duple 340. 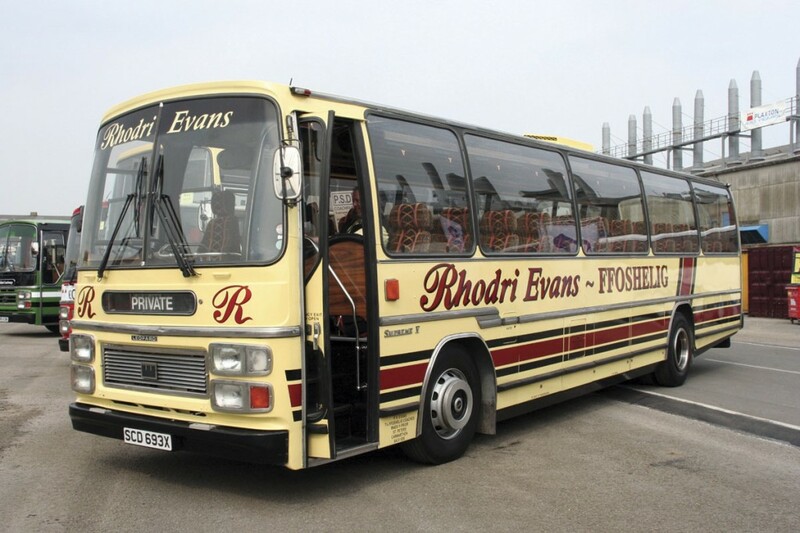 Under Rhodri, the policy was generally to buy secondhand Plaxton bodied Volvo B10Ms and Leyland Tigers, including a couple of ex-MOD 70-seat Derwents. The first new coach he purchased arrived in 1999 in the shape of a Berkhof Axial bodied Dennis Javelin with 51 recliners and a toilet. A new 33-seat Cheetah bodied Vario followed in 2005 and the following year, to operate school and commercial work taken over from Lewis, a new Optare Solo with 33 high-back belted seats was bought, staying until 2013. A further new Cheetah, but with the revised styling, appeared in 2011 and again this was a 33 seater. Rhodri attended the Plaxton Centenary celebrations in 2007 in this Supreme V bodied Leyland Leopard which is now preserved. Many people wrongly assumed from the registration that it was ex Southdown. It had been new to Bicknells, joining Lewis, Whitland in 1985 and when sold by Rhodri had covered only 250,000km in 31 years. After the 2011 Cheetah, no more new coaches were acquired until a Mercedes-Benz Tourismo entered service on 1 January this year. This has been built to a straightforward 55 seat specification with no toilet and no television. Rhodri opted for it after good experience with Setra S315GT-HDs he had operated, including an ex Clarkes of London example dating from 2001 with an Allison automatic transmission and a 1999 example that had been new to Parrys but came from Silver Star in 2004. 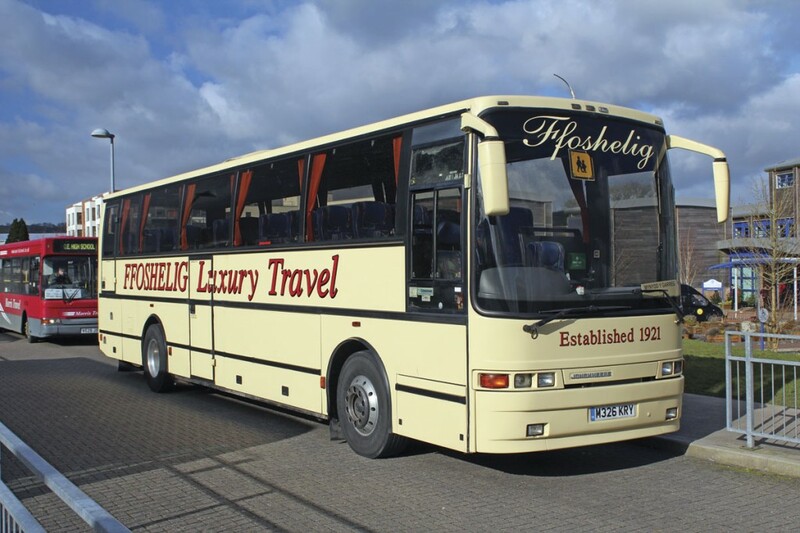 Although no other new purchases were made over a five year period, investment continued in upgrading the fleet with purchases including a former Richmonds of Barley Van Hool Alizee, two 70 seat Javelin Plaxton Premieres from Jones, Login, in 2011, and in 2013 the VDL SB4000 Berkhof Axial which was recently sold. There was nothing wrong with the Axial but it was 12.9m long and could be an issue on country roads, prompting Rhodri to standardise on a maximum of around 12m. A variety of other types of coach have been owned including Leyland Tigers, various Volvos, an LDV400 and a Cymric converted VW with a ‘sparkly’ illuminated ceiling. The only Scania owned carried an Irizar Inter Century body. 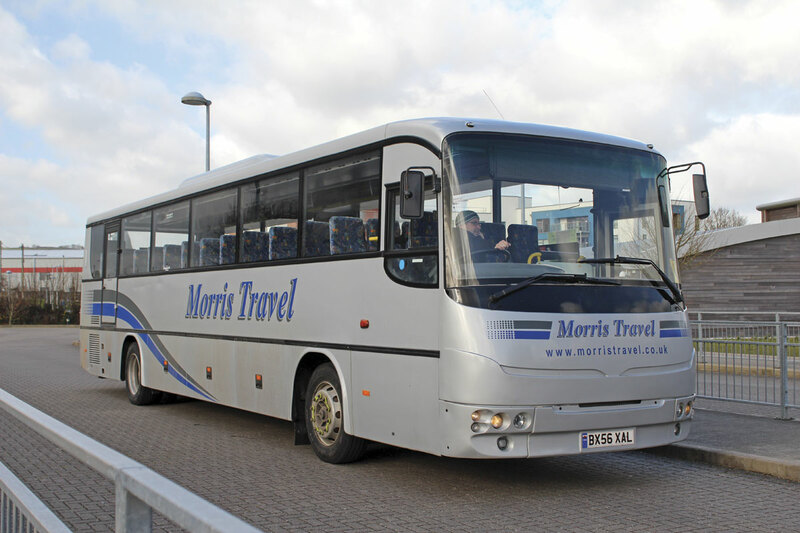 Another recent departure was a 1983 Volvo B10M Plaxton Paramount 3200 that had been bought in 2004 from Jones, Login. 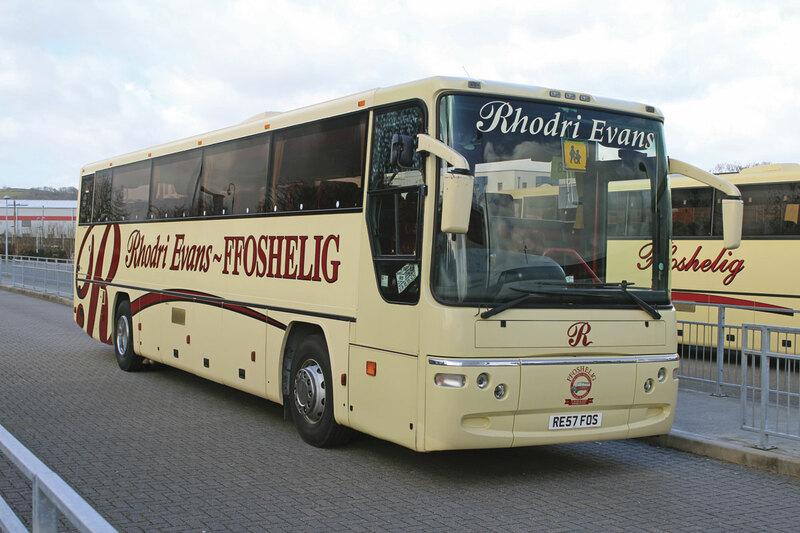 Rhodri had ‘always wanted’ this low mileage coach from a good home and considered the Volvo Plaxton combination ‘the one to have’. It was sold last year having been retrimmed and repanelled during its stay and is now in semi retirement in the fleet of Fowlers of Holbeach Drove where it has joined a Bedford YNV Venturer, a Leyland Tiger and a Leyland Worldmaster/Leopard with similar coachwork. Although fond of it Rhodri does not regret selling it saying, ‘I’ve got a 1995 ex Clarkes B10M Jonckheere that is now over 20 years old (the limit for contracts locally) so there is only so much back-up I need. I’m not a showman.’ He has only ever entered two shows, one of which was the first all Welsh Truck and Transport show, held just over the road from the depot at the United Counties Showground in 2007. It was quite a success as he won Best Coach, Best Vintage Coach and Best Coach Fleet. He also put in an appearance at Plaxton’s centenary celebrations in Scarborough in an ex Bicknells Tiger Supreme V that is now preserved in North East England. The approach is that everything in the fleet can do everything, which it can, save for the complication of the LEZ for some of the coaches. 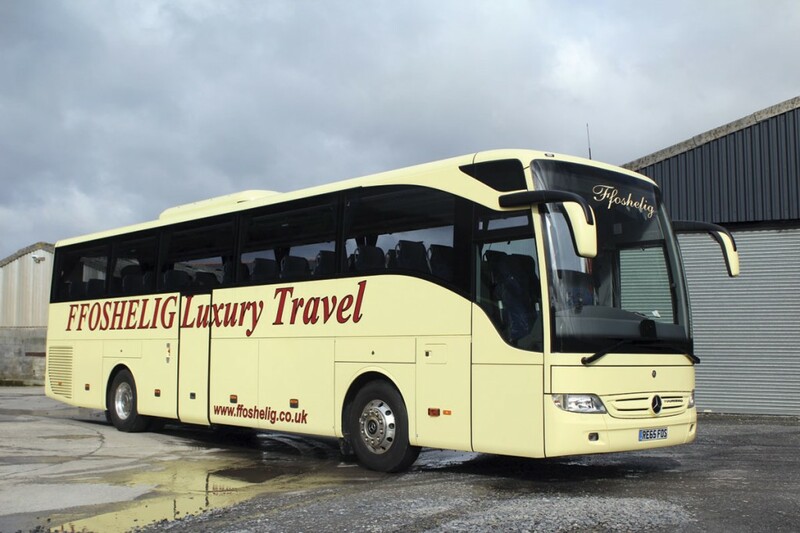 For the future Rhodri’s current thinking is that he will probably buy Volvo B8R Plaxton Leopards for local work and Mercedes-Benz Tourismos for other work. ‘One thing I will not buy is a tri-axle. I’ve also said that I don’t want anything longer than 12m, as good as that VDL was. I know the Leopard is 12.8m long but I’m told they are bringing out a shorter one,’ he said. Nine full timers make up the driving team piloting the nine coaches that are out every day. The one man, one coach principle is followed generally but not religiously. Backing them up are Rhodri, Debbie and half a dozen part timers who come in as and when. Rhodri believes the number of younger drivers being attracted to the industry is something that needs looking at. The average age of the Ffoshelig team is ‘probably in the 50s’, indeed apart from Debbie he believes only two drivers are younger than his 48 years. Having left CPT in 1999 because he was disgruntled over what he felt was a lack of support, Ffoshelig is now an enthusiastic participant in BUSK’s Benchmark scheme. He first started talking to the organisation a couple of years ago though it took him a year to fill in the paperwork and send it off and it was October 2015 before the necessary audits were completed. ‘It’s being part of a trade organisation and a scheme that rewards good business practice. 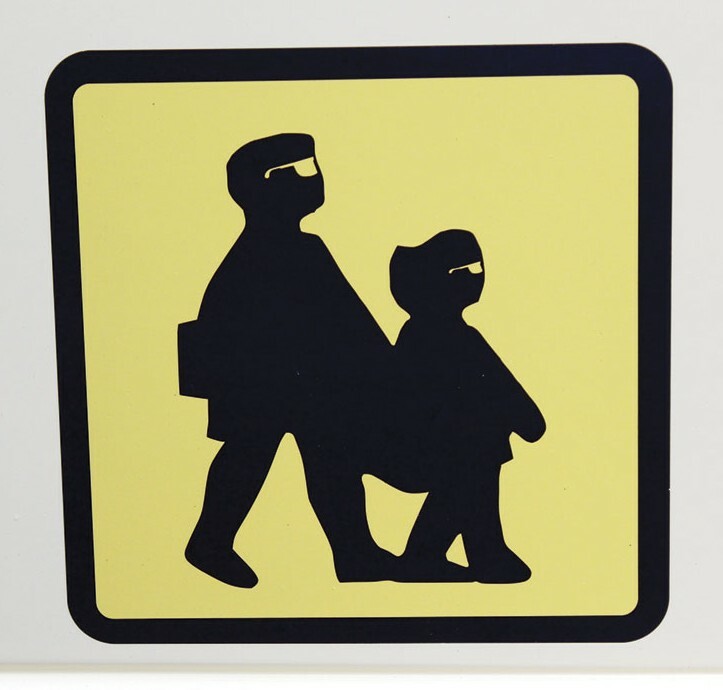 It’s in the same manner as a catering establishment that has the hygiene score on the door. It gives the general public food for thought. Hopefully, in time, we can educate the public to use Benchmark operators rather than going on price alone.’ So far, he admits nobody has ever asked whether he is a Benchmark member but believes that it has more of a long term benefit than ISO9001 because Benchmark understands the industry better.